Zélie remembers when the soil of Orïsha hummed with magic. Burners ignited flames, Tiders beckoned waves, and Zélie’s Reaper mother summoned forth souls. But everything changed the night magic disappeared as under orders of the ruthless king, all maji were killed including Zélie’s mother. Now she has one chance to bring back magic and strike against the monarchy. With the help of her brother Tzain and rogue princess Amari, Zélie must outrun crown prince Inan who is hell-bent on eradicating magic for good. But she’s not only got to learn to control her powers, but she must also control her growing feelings for the enemy. Children of Blood and Bone is told from three perspectives; Zélie’s, Amari’s and Inan’s and each of them had a distinct voice. Zélie is a divîner, which is someone who has dark skin and white hair which is a sign of the magic that would run through her veins if magic hadn’t had been destroyed. Divîner’s are an oppressed people, they are poor and are often abused and belittled by the King’s guards. Amarai and Inan are siblings who have both been brought up in the castle and, in Amari’s case especially, sheltered from what happens in their country. I liked Zélie a lot, she’s fierce but impulsive and she cares fiercely for her loved ones. Amari was my favourite character and is probably the one who goes through the most consistent character arc. She’s lived a sheltered life, but she has a strong sense of morals and when she gets the chance to change things and stop her father she takes it, putting her life on the line. She is sweet and naïve to begin with but as she learns how the world works and how people act, she gets smarter and she’s more resilient than she realises. Inan is a character that I never really warmed to. He is desperate to show his father what a great soldier he is, and how he will be a worthy king, but then he also flip flops on his beliefs multiple times throughout the book. He doesn’t have a strong sense of self, will change his mind on things depending on who he’s with, and is generally a disaster and not in a fun, appealing way. I read almost 400 pages of this 535-page book in the space of two days but then I got to a point, where I got so annoyed with what some characters were doing that I put it down for five days and had to make myself continue with it. Children of Blood and Bone has an enemies to lovers romance and while the foundations of this relationship were interesting, at that 400ish page mark, there was some serious instalove as these characters went from hating one another to barely being able to keep their hands off of one another in the space of about three pages. It was way too fast and seemed needless. Their romance caused conflict with other characters, but that conflict could’ve still happened with them being reluctant allies instead of being in love. Also, their sudden infatuation with one another seemed out of character for both parties and it was a detriment to Zélie’s character especially. 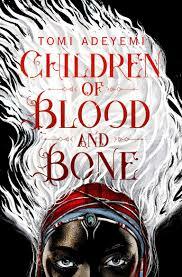 Besides from the romance which I hated, I really enjoyed pretty much everything else about Children of Blood and Bone. I liked the writing style, it’s has vivid descriptions of this world and culture without being overly flowery, and how the friendship grew between Tzain, Amari and Zélie was great. I especially liked how Zélie slowly opened up to Amari, and how Amari figured out her own inner strength. Children of Blood and Bone is a fast-paced and action-packed story. The world and its magic system are interesting, and the mythology that is introduced can only grow in future books. As a first book in a series, it’s a great introduction to the characters and the world, but I wish it had taken its time with the romance as that did sour my experience of the last quarter of the book. I do plan to continue reading this series though and I’m intrigued to see where everything will go from that ending. 4/5.